The houses are of four storeys with basements. They are each three windows wide except for No.11 which has four windows. The windows have gauged red brick arches and dressings to flush frame sashes. 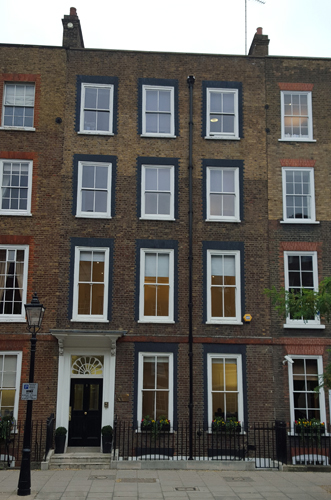 The windows of No.8 were reglazed in the nineteenth century and display two-over-two rather than the original treatment of six-over-six. Brick bands at first floor level. No.8 has a wooden architraved doorcase with good carved brackets, panelled soffit to flat hood, patterned fanlight and panelled door. The interior of No.8 has fully panelled ground floor rooms and box cornices. The entrance hall also is also fully panelled with Corinthian pilasters forming an inner arch. It has a fine open-string staircase with twisted balusters and decorated tread ends, counterpoised by a continuous dado on the other side. I was asked to advise on appropriate paint and colours. A few years ago I had advised on No.13 Bedford Row. Click on the griffin for more information on what I do.